NETWORK FINALS: THE CARMICHAEL SHOW’s premiere became even less impressive with a 0.1 dip in final numbers. CABLE HIGHLIGHTS: WGNAmerica’s UNDERGROUND premiered at 0.39, even better than the 0.33 premiere of OUTSIDERS earlier this season. CNN’s airing of the Univision DEMOCRATIC DEBATE topped Wednesday cable at 0.94. ESPN’s NBA doubleheader was led by 0.66 for the late Clippers vs. Oklahoma City game, with 0.35 for Memphis vs. Boston. VH1’s MOB WIVES gained 0.07 to 0.59, and was followed by a 0.34 LARGER THAN LIFE tribute to one of the show’s deceased stars. On Lifetime, LITTLE WOMEN LA slipped 0.06 to 0.58, while LITTLE WOMAN ATLANTA fell 0.16 to 0.49. HGTV’s PROPERTY BROTHERS climbed 0.06 to 0.54, an HOUSE HUNTERS WHERE ARE THEY NOW was at 0.53, with HOUSE HUNTERS INTERNATIONAL at 0.47. TLC’s MY 600-LB LIFE gained 0.12 to 0.47, and FAT CHANCE was up 0.04 to 0.22. MTV’s CATFISH edged up 0.03 to 0.46, and SUSPECT increased by 0.06 to 0.33. On Discovery, DUAL SURVIVAL dropped 0.05 to 0.36, and VENOM HUNTERS rose 0.05 to 0.35. 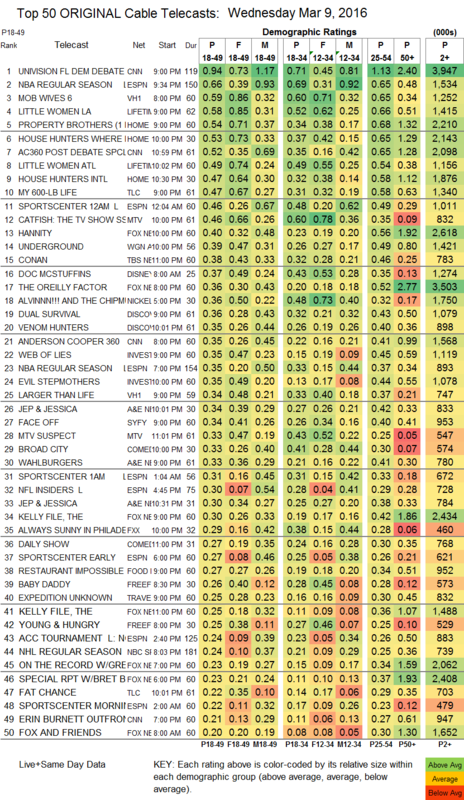 A&E’s JEP & JESSICA lost a tenth to 0.34 and then a second episode was at 0.30, after WAHLBURGERS returned at 0.33. On Syfy, FACE OFF climbed 0.02 to 0.34, but THE INTERNET RUINED MY LIFE premiered at 0.16. Comedy Central’s BROAD CITY lost 0.04 to 0.33. The season finale of FXX’s IT’S ALWAYS SUNNY IN PHILADELPHIA fell 0.02 to 0.29, and the season finale of MAN SEEKING WOMAN held at 0.10. On Freeform, BABY DADDY gained 0.05 to 0.26, and YOUNG & HUNGRY rose 0.04 to 0.25. 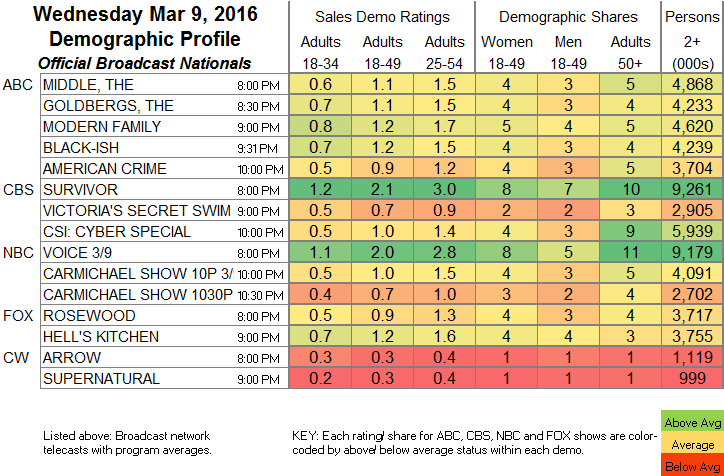 TV Land’s YOUNGER slipped 0.02 to 0.19, and TEACHERS took a 0.05 fall to 0.10. The 2d episode of Sundance’s HAP & LEONARD dropped 0.02 to 0.09. The 1st hour of El Rey’s LUCHA UNDERGROUND was up 0.01 to 0.04/95K, and the 2d hour stayed at 0.01/41K.